Happy spring to everyone in the northern hemisphere! I’m beyond relieved to see it finally arrive as far as the calendar goes. Here’s hoping Ontario will soon see lots of warm weather and the first little green shoots popping out of the soil as well. In the last couple of years, I’ve written about the winter and summer worlds I’d like to visit, so today I’ll be talking about the spring worlds I’d like to see. Yes, I’ll be writing another instalment in this series in the autumn of 2019, so do keep an eye out for it later on this year. It turns out that there are a lot of books out there set during winter and summer, but there aren’t so many of them that are set during this time of the year. Putting together this list was a little tricky! If you have anything to add to it, do speak up. All of the authors I could think of were white, and many of them were British. It would be nice to add other voices to this list. When I was growing up, many of my elementary, middle, and high school English teachers did poetry units in the spring. I don’t know why this pattern happened. It might have been done unintentionally, or maybe teachers are taught to give their students slightly easier* assignments for a while as the end of the school year grows closer. At any rate, I’ve come to associate this time of the year with poetry because of those experiences. *Or at least I found them easier. I enjoy the subjective nature of interpreting poetry. 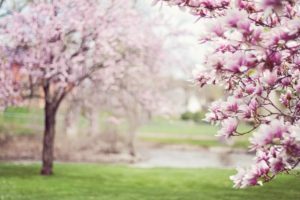 Spring is one of the two seasons of the year when the weather swings wildly between temperature extremes for those of us who live in certain climates. Here in Ontario, you could have a heavy snowstorm one day and warm, sunny 20 C (68 Fahrenheit for you Americans) weather the next. 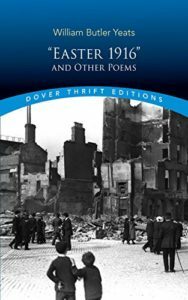 This poem reminded me of those fluctuations, and it made me want to visit this setting for a few minutes despite the dangers of the World War I era. This is one of those childhood classics that I keep referencing over and over again in various posts. If you’ve never read it, it’s about a young girl who moved from India to England to live with a relative after her parents died. The estate her relative lived in had once been grand but were now a bit neglected. She was placed in her new home during the cold part of the year, so it wasn’t until the spring that she realized there was a secret garden on the property that had been terribly neglected. There were so many interesting lines in this book about tending gardens and what happens to plants when no one has looked after them for a long time. Obviously, there were metaphors in there about taking care of the people around you, too, but seeing the transformation of that garden from a lonely, weedy place to what it became later on makes me smile every time I reread those passages. Winter never lasts forever, whether we’re talking about the actual season or as a metaphor for life difficulties. I love the hopeful message there, and I’d sure like to see the Secret Garden from this tale for myself. Don’t listen to anyone who tells you that picture books are only – or even mostly – for small children. There are plenty of picture books out there that are honestly even more meaningful for adult readers. The illustrations in this book are of a farm in springtime. The grass is green, tall, and strong. Wild flowers have sprouted up everywhere. The weather is beautifully mild. Since we’re talking about a fictional fantasy world here, there is no mud or spring allergies like there might be in our world. 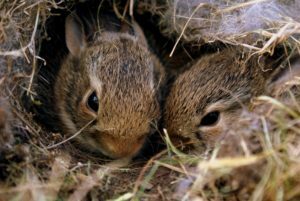 Even without the added appeal of seeing these rabbits in action, reading about what unconditional love looks like makes me eager to visit this world. It would be such a pleasant place to spend an afternoon. The speaker in this poem has lost someone he loved very much. Spring gives him hope that they’ll be reunited again somehow someday. I appreciate the hope he finds in the natural cycle of the seasons and the way that each new spring reminds him of both his love and his grief. Confession: I’ve cried every single time I’ve reread this story. It contains references to a world that many people have forgotten thanks to the miracle of vaccines. This was a place where epidemics ripped through communities and many families lost at least one child because of these horrific diseases. After the main character became gravely ill, his family was advised to burn all of his toys in an attempt to stop the spread of those germs to other vulnerable people. Even his beloved stuffed rabbit was supposed to be destroyed. The boy’s illness appeared to happen in winter or possibly early spring based on how the story was written. I liked seeing the transition he and his family went through from the long, dark days of his illness to what happened after spring arrived and he began feeling like his old self again. The changing of the weather was a beautiful metaphor for all of the other wonderful things that were happening in their lives. Of course I wouldn’t actually want to be sick like this kid was, but it would be so interesting to see the velveteen rabbit in person and maybe even tell these characters about all of the medical marvels to come that someday were going to prevent future families from going through this same experience. 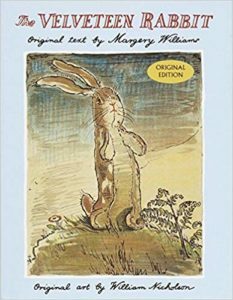 What books do you associate with spring? Okay, so now I really have to read The Raven Cycle. I didn’t realize it was set over the course of one year. Too cool. I’ve never experienced April in a part of the world that had autumn then. That sounds very interesting. Cool post! I’m sitting here completely blanking out on books that are set in the spring so I’m glad you were able to think of some. Yes, absolutely. Do you think you’ll be rereading it? 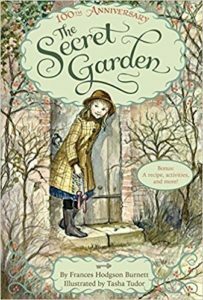 The Secret Garden is a perfect spring book. I have lots of wonderful memories of that one.